A new report,The Female FTSE Board Report 2014, from the Cranfield International Centre For Women Leaders aims to provide an update on progress following the Davies report. The main statistics are summarised in the following table from the new report. The key finding is that FTSE 100 companies have increased the number of women on their board from 12.5% in 2011 to 20.7% today, with the FTSE 250 similarly increasing from 7.8% to 15.6%. By 2014, 36 companies in the FTSE 100 had reached the target of 25% women on boards; and the report forecasts that a figure of 26.7% women on boards should be reached by 31 December 2015. 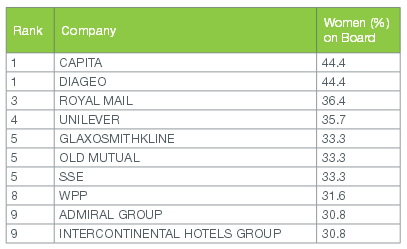 The ten FTSE 100 companies with the highest proportion of women on the boards is shown in the following table from the report. Only two FTSE 100 companies have no women board members: Glencore Xstrata and Antofagasta. It seems the number of female executive directorships is still pretty low: 6.9% (FTSE 100), 5.3% (FTSE 250); but the number of female CEOs has slightly increased, to four with Moya Greene (Royal Mail) and Carolyn McCall (EasyJet) last year joining Angela Ahrendts (Burberry) and Alison Cooper (Imperial Tobacco). All very well, but what impact might all this have on companies’ share price performance? 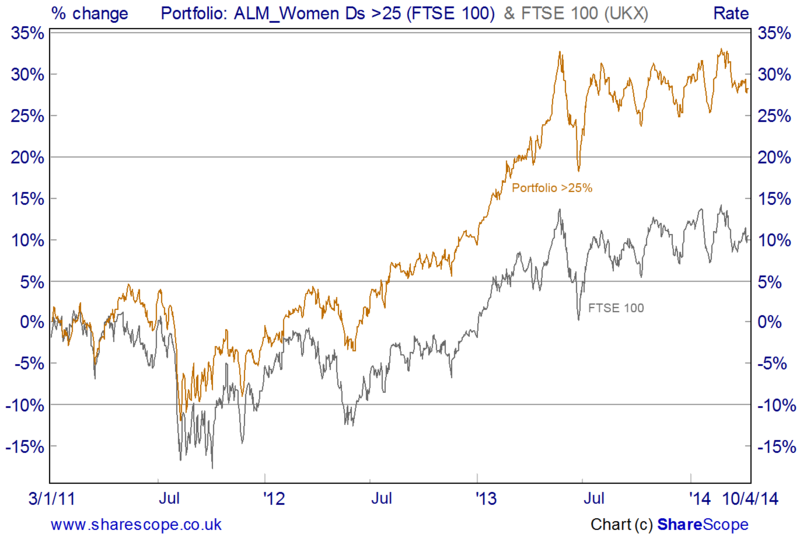 The following chart shows the performance of a portfolio comprising the 36 FTSE 100 companies that have met the target of 25% women on their boards. The analysis starts from 2011, the date of the Davies Report, and the FTSE 100 is added for comparison. 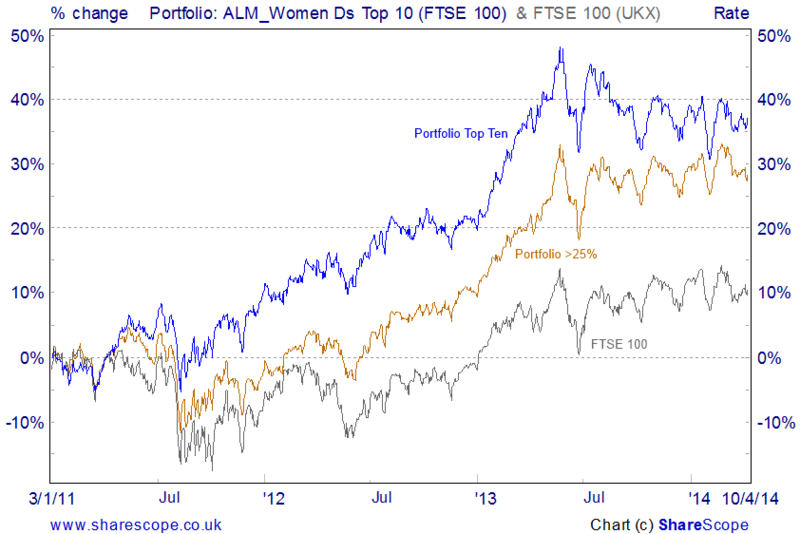 From the beginning of 2011 the portfolio has risen 28% in value, against an increase of 11% in the FTSE 100 Index. The following chart is the same as the above, except a new portfolio is added: this new portfolio comprises the ten companies with the highest proportion of women on boards (as shown in the above table). A portfolio of just the ten companies with the highest female director weighting would have increased in value 37% over the period. It would appear that since 2011 a portfolio of companies matching or exceeding the Davies Report target of 25% female board members would have out-performed the market. Further, portfolio performance would appear to be enhanced the greater the proportion of women on the board. If this is the case then the obvious arbitrage strategy is long women short men. British Summer Time will start this Sunday, 30 March. Although Benjamin Franklin first suggested the idea of a daylight saving time in 1784, it was William Willett, a builder living in Petts Wood, Kent, who first took the idea seriously enough to circulate a pamphlet to Members of Parliament in 1907. Willett’s argument was that advancing the clocks in spring and returning to GMT in the autumn would lead to an increase in health and happiness, and it would also save the country £2.5 million pounds (after taking account of the loss of earnings to the producers of artificial light). British Summer Time (BST) was finally introduced in April 1916, as an economy measure during wartime – a move quickly followed by many other countries in the following few weeks. During the second world war double summer time (two hours advance on GMT) was introduced for the summer, while winter clocks stayed one hour ahead of GMT. For three years from 1968, Britain kept on BST throughout the whole year. But the experiment was abandoned in 1972, since when the Britain has kept GMT in winter and BST in summer. In 1996 all clocks in Europe changed on the same day for the first time. The European Union has now adopted The Ninth European Parliament and Council Directive on Summer Time Arrangements in which summer (or daylight saving) time will be kept between the last Sunday in March to the last Sunday in October. The changes will take place at 01.00 GMT. And the relevance to shares is…? Research has shown that even minor sleep disruptions can cause profound changes in cognition, leading to anxiety, inattention, and impaired judgment. An academic paper (Kamstra, Kramer, and Levi, 2000) looked at the potential effect the switches to and from daylight saving time might have on stock markets in the US, UK, Canada and Germany. The authors investigated the possibility that investors prefer safer investments and shun risk on the trading day following daylight saving time changes. 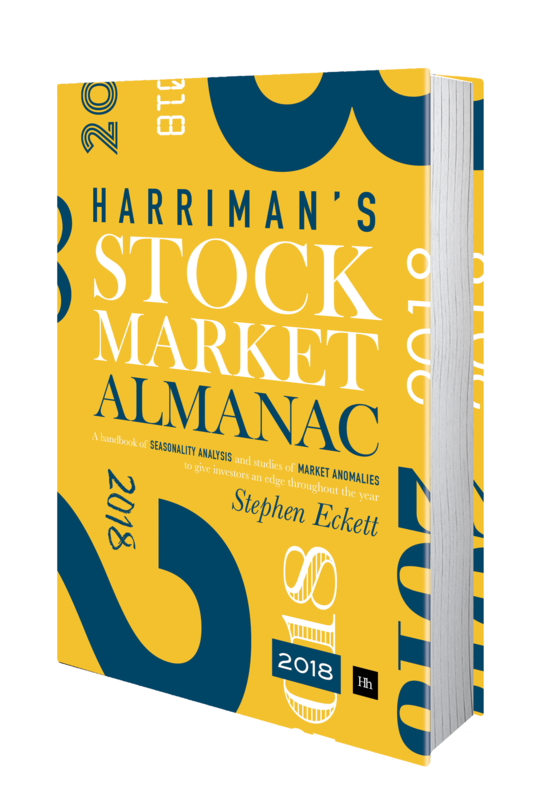 In all cases, it was found that stock returns were significantly lower following a daylight saving time change, than they were on other trading days, even after controlling for other known seasonalities like the Monday effect. This is consistent with anxiety-prone investors selling risky assets on the trading day following the sleep disruption caused by daylight saving time changes. The daylight saving effect was found to be extremely significant for the UK and US markets, strongly significant in Canada, and relatively insignificant in Germany (likely due to the relatively shorter period of data available for Germany since there were no daylight saving time changes in that country between 1950 and 1979). The Autumn daylight saving change had a greater impact than that in Spring. In the US, the financial impact of this phenomenon amounts to roughly $30 billion on average, each time the clocks were shifted over the past 30 years. The following chart shows the FTSE 100 returns for the days following the start of British Summer Time (BST) for the period 1985-2013. Over the period the FTSE 100 average daily return was -0.07% on the days following the start of BST. In line with the paper’s findings, this was significantly lower than the average day returns for all days (+0.03%) and for Mondays (-0.01%).